Site of St Cuthberts parish church 1880-1938. Before this a presbyterian chapel had stood on the site. Landing point on the north side of the river for the "halfpenny ferry". quick trip from Roker Avenue to the Gaumont on a Saturday morning.walk up High Street to Fawcett Street. St Patrick's Garth. There was a Catholic church inside the garth. St Peters Church Monkwearmouth. The west wall of the nave was built in the 7th century. This church would have been known to Bede and St Cuthbert. 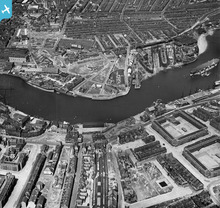 So much has changed on this photo - it's rather difficult to pick out landmarks that hevn't changed! St Peters Church is still there but the shipyards have all gone and the site now occupied by the National Glass Centre and Sunderland University. Much of the housing, especially around the church has also gone. 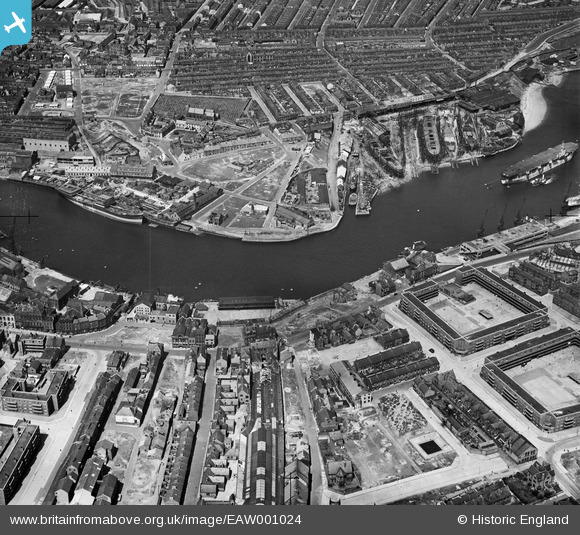 With the demise of shipbuilding in 1986 the river is now much quieter than even this photo. A complete change in the urban landscape over two generations!